APR is pleased to present the K04 Turbocharger System for the longitudinal 2.0T EA888 Gen 2 with AVL. Using 93-octane fuel, the APR K04 Turbocharger System produces an astonishing 348 horsepower and 342 ft-lbs of torque. Unlike the factory turbocharger, power stays strong and doesn’t dramatically taper towards the vehicle’s new 7,100 RPM redline. Switching to APR’s 100 octane race fuel mode, peak power and torque climb further to 363 horsepower and 387 ft-lbs of torque. APR’s calibration experts have safely maximized the full power potential of the turbocharger unit, while keeping reliability at the forefront of their calibration strategies. One of the greatest benefits to the APR K04 turbocharger system is its simple, yet elegant design. APR's CNC-machined OEM compressor cover with integrated DV recirculation mount significantly reduces engine bay clutter and saves the end user from the hidden costs of purchasing extra throttle body pipes, hoses, clamps and DV mounts for recirculating boost pressure. The compact design also removes extra charge piping volume to allow for faster boost response and less locations for boost leaks. Furthermore, charge air pressure is directed directly at the compressor wheel which helps keep the turbo spooled upon lifting the throttle, minimizing turbo lag. With the significant amount of changes included in the APR K04 Turbocharger System, APR’s Engineers spent months calibrating the engine management system, including hundreds of hours of in-house chassis dyno development. Drivability, gear changes, cruising and part throttle operation were tuned to operate smoothly as if intended by the OEM through proper torque management. APR’s Electrical Engineers built new coding functions, strategies and routines into the ECU to control conditions normally unseen at factory power levels. Thanks to APR’s incredible proprietary calibration suite, data logging software and full access to the coding structure of the ECU, appropriate and intelligent changes are made to ensure flawless drivability and excellent performance without compromise. APR’s Calibration Engineers restructured the engine’s volumetric efficiency (VE) model to correctly determine the ECU’s calculated load and deliver proper torque management. Thanks to APR’s patented boost control coding, the ECU is able to perform closed loop boost control well beyond relatively low limits dictated by the factory structure. This directly translates to safer and more predictable operation while additionally producing more power and torque across the entire power band. APR’s Calibration Engineers have optimized cam timing, runner flaps, valve lift, ignition timing, engine load and lambda to provide tremendous leaps in power while retaining the OEM knock control strategy. The result is safely achieved power, optimized for various fuel grades found around the world from low-quality pump fuel, all the way to high-quality, oxygenated race fuels. To aid in turbocharger reliability and longevity, APR’s engineers carefully studied the turbocharger’s compressor maps to avoid regions where compressor surge may be experienced. The K04 turbocharger has fantastic response characteristics and is able to produce incredibly high pressure at low airflow levels, but in doing so, the turbocharger runs into issues of compressor surge. In the area between 3000-4000 RPM, APR’s Calibration Experts have elected to limit boost pressure. Torque management plays a big role in how the vehicle feels and performs, especially during moments of low gear, rapid acceleration. Since APR’s torque management system relies on the engine management’s phenomenal torque reporting abilities, it is able to adjust to every environmental situation it encounters. To achieve a targeted torque level, the ECU applies the appropriate changes to mass airflow and ignition. Horsepower and torque were measured in APR’s in-house, Soundmaster dyno cell, using a Dynapack all-wheel dynamometer. Multiple stock and modified runs were conducted and the SAEJ1349 corrected results were averaged together to represent the differences between a stock and APR K04 2.0T. Crank power figures were estimated based on VAG’s factory advertised results. - Reported wheel figures measured using a Dynapack Dynamometer with a US Spec B8 A4 6MT, using SAEJ1349 correction and an average of multiple runs. Crank figures are estimated based on the measured wheel figures. Results may vary depending upon environmental conditions, vehicle, transmission, vehicle health, operating conditions, temperatures, fuel grade, dyno type, dyno setup, other variables and other modifications. A high flow Race DP exhaust system is required. 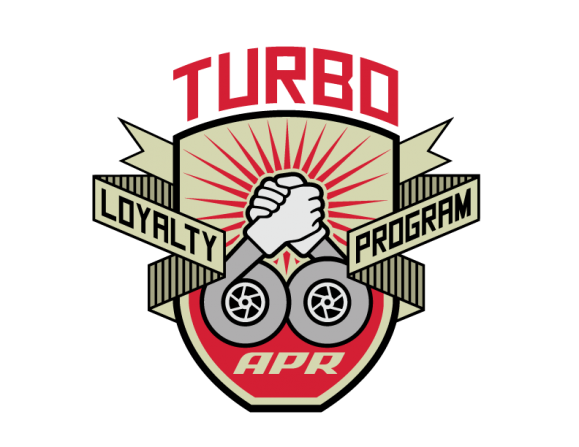 APR Recommends a full turboback exhaust system for maximum performance. APR highly recommends an upgraded intercooler system to meet the advertised power figures.